Latin is a difficult language for English speakers for two main reasons. First, Latin has not been spoken as a native language for centuries, so it is nearly impossible to immerse oneself in the language in comparison to languages such as French or Spanish. In addition, the Latin taught in most programs is that from the Classical period (about 100 B.C. to 200 A.D.). Perhaps if students learned Latin from a more recent period such as the Renaissance period (1300 to 1500 A.D.) there would be a better cultural connection between modern students and the dead language. Second, the structure of Latin is far different from English. As a Germanic language, English has been criticized as being stoic in comparison to the romantic, albeit pedantic, structure of Latin’s grammar. The unimportant word order, the preciseness of meaning, and the seemingly endless inflections make Latin difficult for the native English speaker familiar with an unyielding subject-verb-object word order and uniform word forms across different parts of speech. Success in translating sentences from Latin to English and back again requires not only a deep understanding of Latin grammar but an equally deep understanding of one’s own native language. Without a proper frame of reference, the Latin student ignorant of academic knowledge of his/her own language, languishes trying to attach meaning to the core concepts of language and its function in expressing meaning. Language study requires an understanding of words in trying to express meaning to a reader or listener. Words can be broken down into three main categories: meaning, part of speech, and function. These three categories, taken together, can help the Latin student better translate words from one language to the other by deconstructing a sentence to its components and then reconstructing the components into meaning understandable in both languages. The first step in translating a Latin word is to identify the word’s meaning. Simply put, what is the definition of a word? So many words in the English language have Latin derivations that students without any Latin training can translate some Latin words. It does not take instruction to realize that the Latin word “fragmentum" means “fragment" or that an amorous (from Latin amare, to love) person is in love. English speakers do not call trees “arbors" but they do know that to see different species of trees they can visit an arboretum. Athena Bona cucurrit. Celeriter cucurrit. The good Athena ran. She ran swiftly. Notice that the word “bona" is an adjective in its feminine form to agree with the gender of “Athena." Also notice that the translation of the second sentence indicates that the subject is “she." Without more information, “cucurrit" could be translated as he, she, or it ran. Since we know that the verb refers back to Athena, “she" is the most appropriate translation. This concept of gender agreement for both the adjective and verb is foreign to English speakers. Understanding the meaning of a Latin word requires more than just a definition, it requires auxiliary information such as gender to make translation possible. Words in any language fall into one of eight categories known as parts of speech. The eight parts of speech are noun, pronoun, verb, adverb, adjective, preposition, conjunction, and interjection. These parts of speech indicate how a writer or speaker uses a word in a sentence. The boys love the girl. 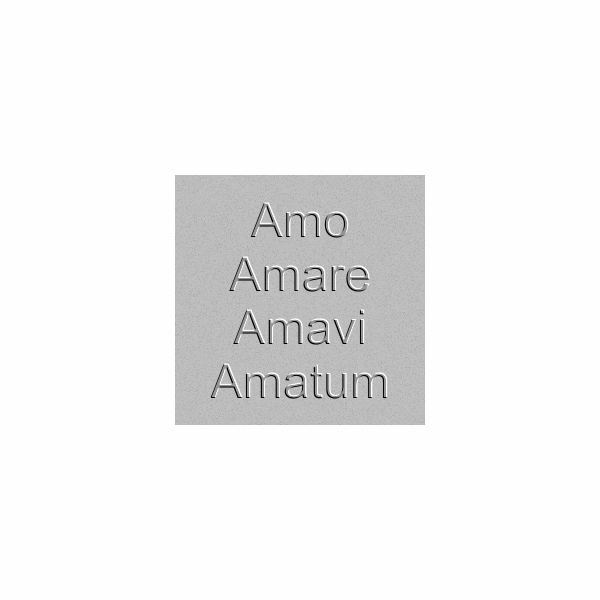 Notice how both words “amor" and “amant" have the same root from the word “amare" but have different forms based on their part of speech. The advantages of this precise specification is a double edged sword. On the one hand, it makes identification of Latin parts of speech undeniable. However, with different forms for each part of speech, the number of word forms can seem exponentially large to Latin students. Consequently, what is gained in precision can be lost to complexity. English speakers need learn early in Latin study that patterns of forms rather than every form of a word should be memorized. Now that the word “puella" is in the nominative case, we know “girl" is the subject of the sentence. “Puero" now in the dative case, is the person to whom to the girl is giving the flower. Notice that “rosam", the object of the verb “dat", remains in the accusative case in both sentences. Also, notice that regardless of the gender of the subject, “dat" remains unchanged as well. Although nonsensical, this is a grammatically correct sentence. By changing form, the words of a Latin sentence come to life and fit together to form expressions. Like cracking a puzzle, identifying a word’s meaning, part of speech, and function in a sentence allows a translator to understand the meaning of a writer or speaker. Unlike English, Latin is precise in how words are formed to express this meaning, so much in fact, that Latin word order is largely unimportant. Hence, Latin is construed as a more romantic language than English’s Germanic origins allow. By following a logical progression of identifying three characteristics of each word, Latin students will find that translating from Latin to English is a logical process where each piece of the puzzle fits to express meaning.